It was around Christmas 2012 and my boyfriend asked me what I wanted. "I want the Huetiful Hair Steamer!" I pleaded asked. He was a bit confused as to why I didn't want something like jewelry, but I have been eyeing that steamer for months prior. Fast forward to more than a year and a half later and this was one of the best Christmas presents I have ever received! It is absolutely worth it as a gift, or a splurge and your hair will be oh so thankful for it. So what exactly is it? What does it do? The Huetiful Hair Steamer is an at home hair steaming device that will change your hair for the better. and hydration of the hair up to 5 times better than just using a conditioner alone. It also helps by replenishing moisture lost to damage from keratin treatments, relaxers or overuse of heat tools. It also significantly and split ends caused by dry hair while improving manageability. The steamer is on a and will automatically shut off after a session is done. Sometimes I do add more water and do a double steam session if I have the time. Those are their words. So what are mine? Because my hair is color treated and naturally super dry (thanks, genetics) I try to use my steamer once a week. There are times I will do it once every other week but I usually don't wait any longer than that between steam treatments. Based on your personal preferences and condition of your hair, you can steam even once a month and still gain the excellent benefits but the more you steam, of course the better! If you do color treat your hair, make sure to wait 10 days after you get your color done to steam or it is possible to lose some of your freshly color pigments in your hair. This also goes for any kind of heated deep treatment. I also notice added shine, extra bounce and my strands feel softer. From my first time using the steamer and every time after, the main benefit I notice is my 2c/3a curl definition always increases after the treatment. I have been trying to grow my hair really long for a few years now and I think the addition of steam to my deep conditioners is helping to make my hair strong. The steamer also helps nutrients from deep conditioner penetrate to the scalp which can also help to promote hair growth. For maximum benefits out of my Huetiful Hair Steamer on my long, thick waves, I like to apply my deep conditioner of choice in my hair section by section then combing out any tangles. After that I make 4 to 6 mini buns on the top of my head and clip them secure. This just helps the steam to penetrate my hair more evenly and effectively as opposed to just one big, thick bun. I also like the leave the ends of my hair out of the buns because they are the oldest so really need the most treatment they can get. During the winter, when the air is very dry, hair benefits from steamer treatments so much. 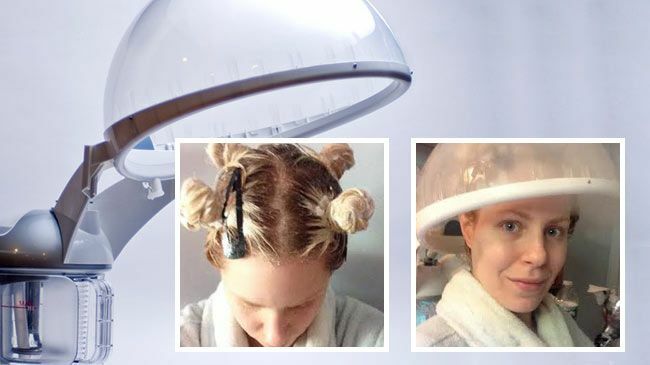 Using the steamer helped my hair not be completely limp, dull and dryness this past brutally cold winter. My steamer also came with the facial add on. I like using this also because not only is it relaxing but it keeps my skin soft, hydrated and helps open up my pores so when I use a clay mask after it really helps remove any impurities. If you are on the fence about whether the Huetiful Hair Steamer is worth it, jump over that fence! I think you will be pleased and it will attribute to many good hair days that to me, are priceless. See what others in the curly community have to say about the Huetiful Steamer here. And if you've used it, remember to leave your review, too!